Answer the following questions as per the best of your judgment. Veena is taller than Anju but shorter than Rita. Sushma is taller than Veena and Meeta. Meeta is taller than Veena. 1.Who among them is the tallest? 2.Who among them is the shortest? Read the information given below and answer the questions given below it. i. There is a family of 5 persons Champoo, Mimpoo, Ragoo, Himpoo and Bagdoo. ii. They are working as a musician, tailor, carpenter, trader and an actor. iii. Mimpoo, an unmarried tailor, is the daughter of Champoo. iv. Bagdoo, a carpenter, is the brother of Ragoo. v. Ragoo is the husband in the only married couple in the family. vi. Champoo, a actor, is the father of two sons. vii. The daughter-in-law of Champoo is a musician. 3.Which of the following is a group of female members in the family? 4.Which of the following is the married couple? 5.Who is the musician in the family?. 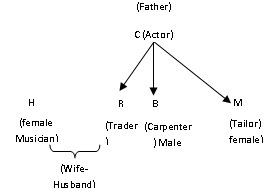 6.Who is the trader in the family ? 7.Which of the following represents the combination of tailor and trader respectively? Which of the following means “bright” in that code language? Prabir starts for office every morning at 9.15 a.m. and reaches office at 9.55 a.m. On Wednesday he started five minutes later than the time he started on Friday. Three days out of five days in the week he started late, out of which Friday was one of the days. 9.In how many days he started on time? It is already stated in the question that three out of five days he started late. So two days he stated on time. 10.At what time did he start on Wednesday? Since we do not know the time at which he started on Friday , we cannot say anything about his starting time on Wednesday.